medac GmbH is the only German pharmaceutical company to offer both diagnostic and therapeutic agents originating from its own development and production activities. For personalised medicine this creates a very good basis for the development and ongoing improvement of active ingredients. Precise individual patient-based diagnosis is crucial for optimising therapeutic measures and for ensuring maximum treatment success. Laboratory and logistics center Tornesch The medac Diagnostics team employs 50 staff members who are responsible for the development, production and marketing of in-vitro diagnostics (IVD). These products comprise standardised methods and reagents that are used in specialist laboratories to test patient samples (of blood, cerebrospinal fluid, urine and tissue) and to identify particular disease states. medac GmbH specialises in the diagnosis of infectious diseases and cancer and in partnering with life science research, supplying its products to laboratory doctors in private practice, hospital laboratories, pharmaceutical and biotech companies, and research institutes. Our field representatives medac has decades of experience in the development of diagnostic products designed to identify diseases that are caused by bacteria, viruses, parasites or fungi. To identify the acute phase of an infectious disease, medac Diagnostics provides laboratories with modern methods based on microbiology, molecular biology and immunohistochemistry. These methods permit direct detection of a broad range of pathogens. To establish the disease stage, immune system response or success of immunisation, medac supplies test kits for the determination of pathogen-specific antibodies. Enzyme immunoassays for infection serology incorporating assay methods patented by medac satisfy the very highest quality standards. Our diagnostic products for infectious diseases are used mainly in the fields of reproductive medicine, the diagnosis of sexually transmitted diseases, pregnancy and transplantation diagnosis, and the diagnosis of tick-borne diseases. 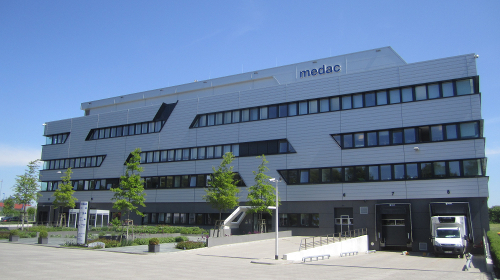 In the field of cancer diagnosis medac focuses particularly on the use of special methods such as immunohistochemistry for the identification and differentiation of tumour tissue. These methods permit visualisation of tumour-specific proteins under the microscope. The results often yield valuable information about the individual characteristics of the tumour, thereby helping doctors to select appropriate therapy for the patient. For tumour diagnosis the medac range comprises more than 4,000 individual reagents of tested and certified quality. The medac Diagnostics team also makes innovative contributions to research and development projects by developing diagnostic tools to monitor the efficacy of medications in clinical therapeutic studies. Our highly qualified team of specialists – armed with the extensive medac portfolio of antibodies and assay reagents – is on hand to assist with the diverse methods used in life science research and with the development of new diagnostic products in universities, research institutes and biotech companies. Comprehensive diagnostic evaluations, independent expert reports from opinion leaders and numerous scientific publications attest to the very high sensitivity and specificity and the diagnostic reliability of medac products. Ever since 2000 all in-vitro diagnostic products from medac GmbH have been CE-certified by TÜV. The medac Diagnostics team attaches particular importance to providing ongoing specialist support for doctors and technical staff working in client laboratories. Scientific information and training are also integral to the service provided by our team, as well as answering queries and supporting problem-solving in routine diagnostic practice.